Batman & The Penguin Prize slot machine from Playtech has between 3 and 6 reels and 4,096 paylines and is of course based on the battle between Batman and his arch nemesis The Penguin in the 1960s TV series. This truly brilliant slot in the DC Comics series has a max jackpot of 100 coins per line bet (non-progressive) and one bonus round, which re-spins bonus that is too good to be missed. You can check out the full Batman & The Penguin Prize slot review below. 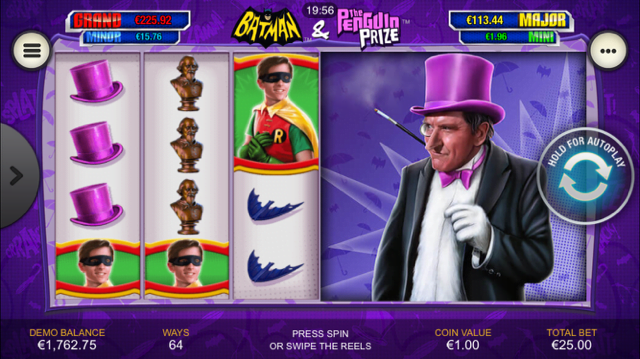 One of the great things about Playtech’s Batman series of jackpot slots is that each title has its own distinctive reel set-up that makes it play quite differently from any of the other games – and with its unique expanding gameboard, the Batman & The Penguin Prize slot is certainly no exception. Starting off as a three-reel, 64-payline title, the Batman & The Penguin Prize slot machine benefits from a series of bonus re-spins that will see new sections of the gameboard open up to reveal more ways to win. Visually similar to the other games in the Batman franchise, the reels again feature Batman, Robin and Albert, with the Penguin, his top hat and his signature umbrella all being added as unique icons. Playable from as little as £0.25 per spin, mobile casino players can get up to four bonus re-spins on any given turn, with increasingly large symbols being added to the reels to further boost their wins. On top of that, players can also be granted random access to the DC Super Heroes Jackpot prize pools during any base game spin, with this being the feature that can potentially award life-changing cash payouts. When addressing the gameplay in the Batman & The Penguin Prize slot, it should be noted that the slot doesn’t offer any special features per se, but instead plays like one long bonus round throughout. Activate a winning payline on the first three reels during your opening spin and you’ll be awarded a bonus Penguin Respin on the second half of the board – another three-column, 64-payline reel set. During this bonus respin, if you land a Penguin symbol on all three reels, you’ll trigger a second respin – and it’s here where things really start getting interesting. Now all six of the game’s reels will be open to create a total of 4,096 ways to win, with 2×2 Super Symbols added to create bigger wins. Land another win during this enhanced respin and you’ll trigger a fourth and final respin, with the 2×2 Super Symbols being replaced by 3×3 Mega Symbols. Regardless of whether or not a win is created during this final respin, players will be returned to the base game and will have to start the process from scratch – but by this stage, they should have already accumulated a substantial payout. Again providing a completely unique user experience, the Batman & The Penguin Prize mobile slot is a hugely engaging slot that grants players the potential to win substantial payouts on any base game spin. Like the Batman & The Penguin Prize slot review? Check out these as well…..